Tunstall used the following device as its arms although it never received a grant to use them - of the six towns only Burslem (as the 'Mother' town) had official authority to use arms. Tunstall has no town motto. The seal probably came into being in 1866 when the Tunstall Burial Board was formed. In the chevronel is the Stafford Knot and two scythes which are from the arms of the Sneyd family. The Scythe also appears in the Burslem arms. The three vases represent the pottery industry and in the the upper left corner is a representation of two bottle kilns. In 1912 arms were granted to the new county borough of Stoke-on-Trent. It was made up of devices previously used in the arms of the constituent six towns. 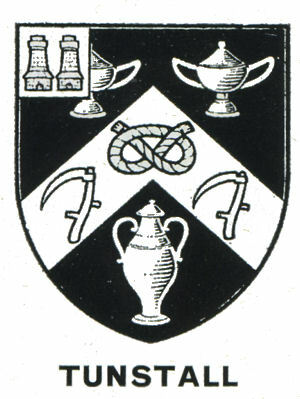 Tunstall was the only one of the six towns to incorporate the Stafford knot in its arms - the knot and the scythe were used in the city arms.